Researching my genealogical connections has given me a sense of my personal relationship with history, and the same holds true for many other writers. 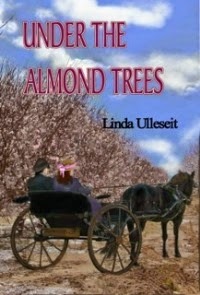 In the following essay, Linda Ulleseit details the background to Under the Almond Trees, a fast-moving saga about her courageous female ancestors and their involvement with early California history. I am blessed to have many strong, interesting women in my family. 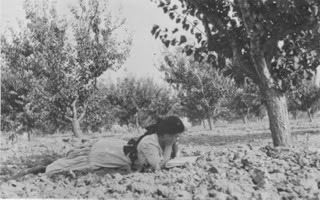 When I decided to write Under the Almond Trees, I chose three that influenced women’s rights in early California. I believe they lived their lives as a legacy of determination to achieve dreams. They didn’t necessarily want their descendants to do what they did; they only wanted them to have a wider opportunity. First, I gathered family stories about the three women, my grandmother, my great-aunt, and my great-great grandmother. My favorite story of them all is how my great-great grandmother ran her husband’s lumber mill when a falling tree branch killed him in 1862. I am still fascinated by my great-aunt, who built homes in three counties of California at the same time as Julia Morgan. Another good story is my grandmother’s photography business, selling postcards of Tomales Bay to tourists in the early 1900s. These stories are what enticed me to write about them, so I put them in order chronologically. I researched dates such as births, deaths, marriages, and land records. Now I knew exactly where they were during the time of the stories. Historical fiction is only valid if the author researches time periods, so this was next for me. I wanted to place the story in the context of local, national, and world events. My research included the Gold Rush, the Civil War in California, the World Wars, and the fight for women’s vote. Imagine how I felt when I found out my great-great grandmother and her sister wore bloomers only a few months after Amelia Bloomer scandalized New York with them, or that Santa Cruz was a huge supplier of gunpowder for the Civil War. Food, clothing, transportation, and daily life needed to be accurate to the time period. For example, Hershey bars with almonds first came out in 1908, so I could have a character receiving their first one as a gift in 1908 or 1909. I laid out everything I found next to the dates and stories of my characters. Then the hard part began. I had deeply detailed chunks of these women’s lives, separated by many years of nothing. With those holes, I could neither write a biography nor a novel. I would have to fill in with fiction. I have an avid imagination. I have, in fact, written an entire trilogy of historical fantasy novels. This was different. This fiction needed to fit the times and what I knew of these women. My great aunt, for example, came from a wealthy, prominent San Jose family. I know she dabbled in education at several colleges and taught school for a while. I also know that as soon as her father died she enrolled in school to become an architect. From that I can infer her father didn’t approve of her chosen profession. From my research, I know how society’s expectations would have affected her, too. I had to create a believable, passionate character biding her time, waiting for opportunity. Dates and facts are boring. The stories bring history alive. The characters bring the stories alive for historical fiction fans. Authors must fictionalize the less glamorous, less well-known sections of characters' lives. Conversations, attitudes, and minor characters must be created and woven into the historical events and details of the time. For example, I know my great aunt and her partner lived in San Francisco. She worked at a sewing machine company, and her partner was a journalist. Those are the facts. The interesting part is their developing relationship with each other, my great aunt’s passion for architecture, and their reaction to the 1906 earthquake. That is what makes great historical fiction. I hope, in Under the Almond Trees, readers will learn about three little-known women who played important roles in early California and accept my research as complete. Even more, I hope readers will love them as I’ve created them. Somewhere out there may be a distant cousin or old family friend who has heard a different story. I’d love them to share, even if it changes my book! Linda Ulleseit was born and raised in Saratoga, California, and has taught elementary school in San Jose since 1996. She enjoys cooking, cross-stitching, reading, spending time with her family, and taking long walks with her dogs. Her favorite subject is writing, and her students get a lot of practice scribbling stories and essays. 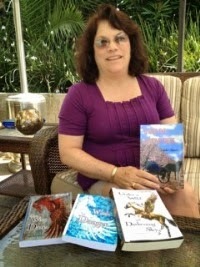 Someday Linda hopes to see books written by former students alongside hers in bookstores. Her first novel, On a Wing and a Dare, was published in 2012. It is a Young Adult fantasy set in medieval Wales, complete with flying horses, a love triangle, and treachery. Its sequel, In the Winds of Danger, was released in March, 2013, and the next one, Under a Wild and Darkening Sky, in 2014. Family histories as rich as these make for fabulous reading.